What a beautiful and gentle-looking creature. My friend Carol lives in rural New York, on the fringe of a wooded area. I love looking at the pictures she snaps of deer through her doorwall window leading to her back deck. Deer laying down in a group in her backyard, or frolicking through the yard (usually enroute to the feeder to feed on birdseed or nibble on her raspberry bushes). Just a peaceful scene Rebecca. Sounds wonderful!!! It would be so nice to be able to look out your back window and see that kind of nature! 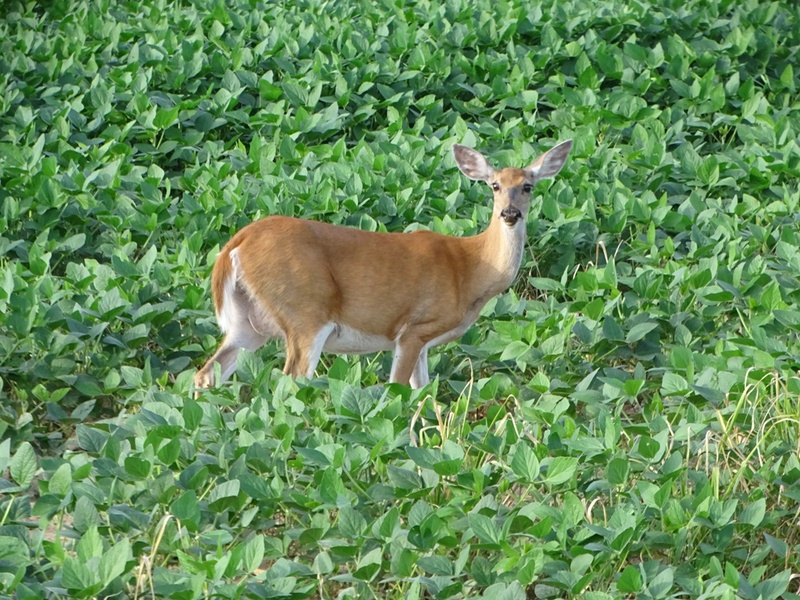 We drove past a field near the river yesterday and I counted at least 10 deer out enjoying the soybeans. It does – she often posts pictures of them on Facebook. I used her pictures in a blog post awhile back – Carol’s three photos are at the bottom of this post. They raid her bird feeder, but she hates to disappoint the songbirds, so she continues putting out seeds which the deer insist on helping themselves to. No fences in this subdivision, so she is at their mercy. I’ve seen people spread corn kernels out on the ground for the deer. It probably wouldn’t stop them from raiding the feeder though. I’ll mention that to Carol. With her three cats and all the ferals that she takes care of, she is at Pet Smart or Petco at least once a week. I’m sure they have corn there. Thanks for the tip Rebecca. do the farmers shoot them for grazing Rebecca? No. There are specific dates during the year that deer hunting is allowed (during the autumn and winter). Love the quote and your picture.